Protects almost any metal against rust and corrosion. Place the shield in any enclosed 2 cu. 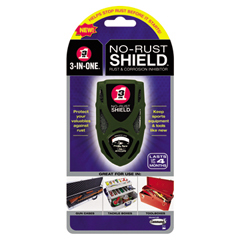 ft. area for protection that lasts up to four months; for larger areas simply use multiple shields. Non-greasy, no-odor formula provides invisible protection that seals metals from air and moisture using Vapor Phase Corrosion Inhibitors (VpCI) technology. Unique time gauge indicates when it is time to replace the shield. 4w x 3/4d x 8-1/2h.